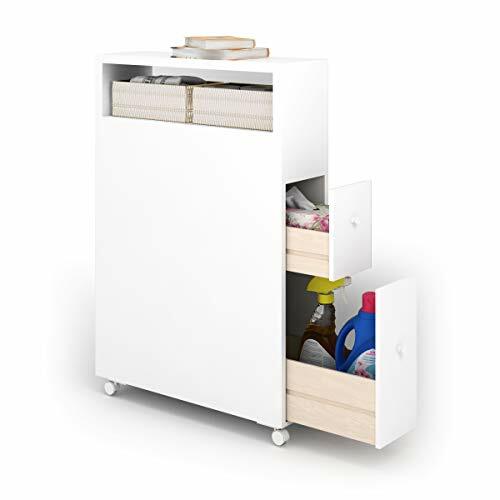 【Multiple Values & Premium Performance】With various drawers, baskets and cabinets design, you can surprisingly place your newspapers, magazines, toiletries, shampoos, creams, towels as you like. The lightweight slide-out bathroom floor cabinet helps you to make full use of space. Its premium performance can totally meet your demand of toilet storage. 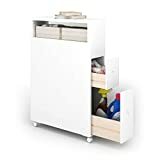 【Optimal Organizer & Space Saver】 It maximizes your bathroom's available space while providing functional storage, which also makes you quick access to your bathroom accessories. The unique cabinets design can perfectly improve the storage efficiency, which also brings a reliable using experience. 【Sturdy Body & Solid Shoulder】Sturdy construction made of MDF material features solid and stable while shouldering your tissues and various kinds of bathroom essentials. It is surely your reliable helper in refreshing your bathroom to a neat and organized place, which can bring you a long lasting using satisfaction. 【Simplistic Style & Concise Appearance】Simplistic style with white brings you a brand new feeling of style. It is also a perfect decoration to fit your bathroom and offers you both concise and convenient life style. 【Portable & Mobile Design】Equipped with four casters, this cabinet is easy to pull out and push back, and it can move across most floor surface smoothly. It is an ideal product for your modern home.